In our original article we described how our interest was sparked by observing the following chiral HPLC behaviour. The two enantiomers of compound 2 (X=Y=Cl) separated nicely on the column. So did the compound where X=Cl, Y=H (4). 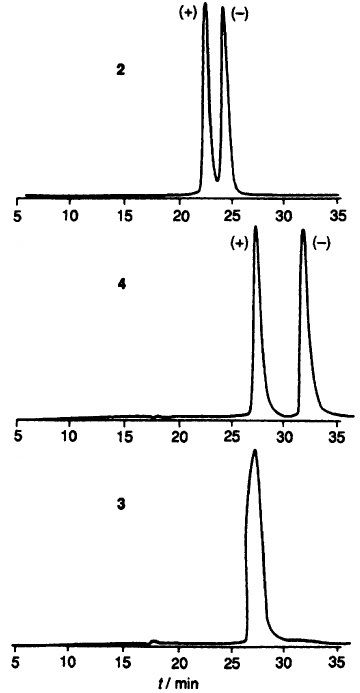 However, when X=H,Y=Cl specifically (3), all chiral recognition on the column vanished! What was the reason? As it happens, we had recently acquired our stereoscopic CAChe system, and the structure was loaded into this. 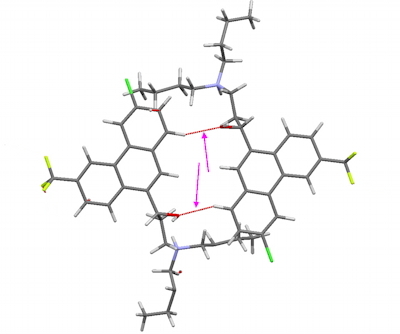 After a little while, we noticed that the compound formed a complementary dimer, glued together by C-H…O hydrogen bonds (magenta arrows below). When the H is replaced by Cl, this edge-on dimeric structure is completely destroyed, and is replaced by π-π stacking instead. The significance is that the hydrogen atom specifically antiperiplanar to the electron withdrawing CF3 group was the one forming the C-H…O hydrogen bond (quite a short one as it happens, see 3D above). This despite 7-bonds separating the H-C from the CF3 group. In the article,we speculated on how this effect of acidifying the hydrogen to encourage it to form a hydrogen bond might even be augmented. On historical note, we had made the article available using the then newly accessible World-Wide Web, providing MPEG diagrams corresponding to the structure above. It would be reasonable to claim that this is the very first article in chemistry to have been made so available, dating from mid 1994! If anyone can find an earlier example, do let me know! You might also note the difference between the MPEG movie and the presentation now available above. 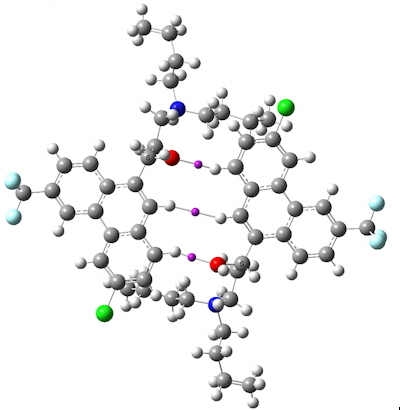 In another part of the world a few years later, Peter Schreiner and his group were exploring organocatalysts based on thiourea (see 10.1021/jo201864e for a recent article) and in 2003 they had discovered remarkable catalytic properties for the system below. As with us, they speculated that in addition to hydrogen bonds formed to substrates from the N-H groups, these could be augmented by rather weaker secondary interactions to the adjacent C-H bonds; certainly the presence of the CF3 groups was the secret of these catalysts (now quite a family). It is tempting to conclude that both sets of observations are related by the same phenomenon! I end here by showing a QTAIM analysis of our halofantrine system (see similar analysis for the Pirkle reagent). The key region indicated with magenta arrows above does indeed contain bond critical points (BCPs), with values of ρ(r) ~ 0.045, which is near the top of the range experienced for hydrogen bonds of this type. QTAIM analysis, showing three bond critical points. Click for 3D. Connections like this probably permeate chemistry, and all too few of them are actually spotted. This entry was posted on Thursday, July 5th, 2012 at 11:30 am and is filed under Chemical IT, Interesting chemistry. You can follow any responses to this entry through the RSS 2.0 feed. You can leave a response, or trackback from your own site. I think what you are referring to is a subtle pseudo-rotation process occuring at an iodine centre, which activates the Iodine reagent as an oxidant, and whether that pseudo-rotation might be expedited by the presence of an activating CF3 group. It is entirely possible, and indeed an interesting calculation to undertake. Go for it!